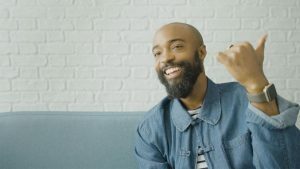 The Film and Media Studies Program, in partnership with the SNF Parkway Theatre, is proud to present an evening with Bradford Young on February 22, 2019 at 6:00PM at the Parkway Theatre. Mr. Young is the award-winning cinematographer of Selma, Arrival, and Solo: A Star Wars Story. He has twice won the Best Cinematography award at the Sundance Film Festival and has been nominated for the Academy Award, BAFTA award, American Society of Cinematographers award, and Critics Choice Movie award for Best Cinematography. He was nominated for the Academy Award for best cinematography for his work on Arrival. He will do his Q&A in conversation with moderator, producer/artist/writer/curator Elissa Blount-Moorhead. This event, sponsored by the Johns Hopkins Film and Media Studies Program and the SNF Parkway Theatre, is FREE and OPEN TO THE PUBLIC thanks to funding from the Saul Zaentz Foundation. More details can be found at the Facebook Event Page.